Singapore is not only colourful and vibrant. It is also tasty. There are different dishes here in Singapore with various influences from Chinese, Malaysian, Indonesian and Indian to satisfy the foodie in us. Modern restaurants also offer cuisines like Italian, American, French, Spanish and many more. Whatever we prefer, there is always something here in Singapore. 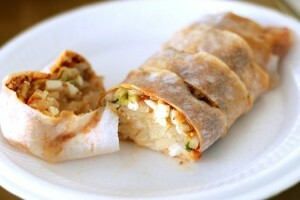 Popiah: Popiah is a healthy meal that features an assortment of vegetables and meat (like lettuce, bean sprouts, carrot, turnip, boiled eggs, Chinese sausage and prawns) enveloped in a thin wheat crepe, cooked to a golden crisp and lathered with a sweet sauce which is called hoisin. Curry puff: Curry puff is an excellent snack. It is a baked pie enclosed in a crust. The pie is filled with chicken, egg, potato, curry gravy, sardines, yam or durian. Duck rice: Not all people know about duck rice. This meal is hearty because it features duck strips and rice with braised sauce. There are restaurants that include eggs, peanuts and tau pok on the side. 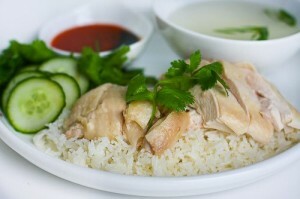 Chicken rice: If there is duck rice, who will forget about the chicken rice? Traditionally it is called Hainanese Chicken rice. This is the country’s well-known dish. Rojak: Rojak is a mixture of dough fritters, beancurd puffs, bean sprouts, roasted peanuts, radish, pineapple and cucumber. Mee Siam: Mee Siam is vermicelli noddle soaked in sweet and spicy gravy (called Assam) with dried shrimp and bean paste. Mee Siam comes with beancurd puff, bean sprouts and boiled egg. Ice Kachang: If we want something cool and refreshing especially during the summer, ice kachang is the perfect choice. The shaved ice comes with assorted ingredients like palm seed, red bean, jelly, grass jelly, chendol and many others. Oyster Omelette: Oyster omelette is famous in Hawker centres here as well as night markets. If we love eggs, this is a must-try dish. It features eggs of course, potato starch and special chilli vinegar. 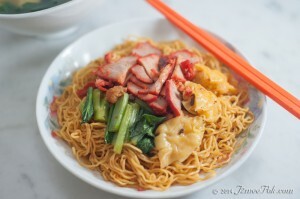 Wanton Mee: If we are craving noodles, wanton mee should be considered. The noodles are drenched with sweet sauce, pork slices and wanton dumplings. There are a lot of foods that we should not miss. We need to support these foods so it will not be lost. These foods are more tasty if we share it with our loved ones.